M is for: MERRY CHRISTMAS! Well didn't that turn out perfectly? I hope everyone is enjoying their Christmas holiday. I'm down in L.A. visiting my cousin Erin and her husband Stu. My mom is here, along with my aunt, and we are certainly enjoying the 70-degree weather and sunny skies. My cousin shares my love for the kitchen, but got the good baking genes in the family. (She gets it from my Aunt Candy, who made a delicious chocolate torte on Friday. I just might have to bust that out for "T" week). 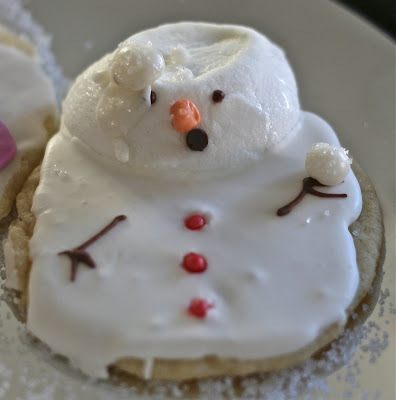 But for the blog, I have been eyeing these melted marshmallow snowmen cookies I saw on Pinterest for a few weeks. It turned out to be a fun project, as we played around with different icings and used our Great Aunt Ruth Kitchell's sugar cookie recipe. First a note about the idea for the melted snowmen. I'm very good about giving credit where credit is due, but I'm not entirely sure who to credit with this adorably genius idea. Truly Custom Cakery claims to be the home of the original marshmallow melted snowman cookie. But this may just be referring to the marshmallow portion because after happening upon The Decorated Cookie Blog, it seems she had the idea three years ago by using fondant for the snowman parts. Whoever's idea it was...I'm giving credit for this stroke of genius and I'm excited to share with all my faithful blog readers. As for the actual cookie dough recipe, I'm using a family recipe. I have no idea where Aunt Ruth got it, but I can tell you that the two secret ingredients are cream of tartar and almond extract. The almond extract makes them taste SO good! Using a stand mixer fitted with paddle attachment, combine butter, sugar, egg, vanilla, almond extract, flour, and baking soda until it reaches a doughy ball. If you are using cookie cutters, you'll want to refrigerate the dough for at least two hours before rolling them out and cutting them. But for these, we skipped that step. Since they are melted snowmen, they can be roughly formed and baked for 7-8 minutes at 375 degrees. After removing from oven, allow cookies to rest for a couple minutes on cookie sheet and then transfer to cooling racks. (BTW...How neat are the double-decker stackable racks?!?) While cookies cool, make the icing. This recipe calls for royal icing, which is the same type you would use if you were making gingerbread houses. We didn't want to buy meringue powder, so we just used the method that calls for egg whites, lemon juice and powdered sugar. If you would like to make this type of frosting, but are worried about salmonella...you should use pasteurized egg whites or better yet, the meringue powder technique. I include both versions below. We also made basic sugar cookie frosting, which is what my cousin normally uses for her Christmas cookies. This is just a simple mixture of powdered sugar, milk and vanilla. We made ours a little more "runny" so the icing would run off the edges for the "melted" effect. Next time, we would probably not make the icing *quite* so thin. I think this actually tastes better than the royal icing, but use whichever one you like best. My cousin had always wanted to make fondant, so we decided to experiment with this type of frosting as well. We chose a marshmallow based fondant, which is VERY sticky when you first take it out of the mixing bowl. Make sure your hands are liberally buttered and then knead it on a silpat with more powdered sugar to get the dough-like consistency. We had a lot of fun with the fondant once we added color and got the hang of it. It's basically like edible playdough. After covering your cookies with your frosting of choice (we tried out all three), you'll want to attach the marshmallows before the icing has a chance to dry completely. To do this, spray a microwave-safe plate with cooking spray and microwave marshmallows 15-20 seconds until they just start to puff up (don't allow them to start melting). Spray cooking spray on your fingers to keep them from sticking and plop marshmallows onto the frosted cookies to make the "heads." From here, let your creativity take over! Using food coloring, dye some of the leftover icing. If using royal or basic frosting, transfer into pastry bags fitted with a 1 or 2 tip. If you don't have a pastry bag, you can do what we did and put the colored frosting into a small baggie and cut a VERY tiny hole in the corner. You can use brown to make arms, faces, etc. For the carrot noses, use orange icing and just sort of pull away from the marshmallow as you squeeze out the frosting. Use mini chocolate chips, mini M&M's or colored dragees to make buttons. Here is what the different frostings look like side by side. Basic frosting on the left with the purple scarf, royal in the middle with the cowboy hat, and fondant on the right with the necktie. We decided we liked the taste of the basic frosting best, but the fondant was definitely the most fun and easiest to work with. It also took a little more effort to make. Pick whichever you like best. No matter what frosting you choose, the opportunities are endless. Cookie decorating would also be a great activity for kids. Get creative and have fun making your snowmen! Using a stand mixer fitted with paddle attachment, combine butter, sugar, egg, vanilla, almond extract, cream of tartar and baking soda. Add flour and mix until it reaches a doughy ball. If using cookie cutters, chill in the fridge for at least two hours. Bake cookies 7-8 minutes. Allow to cool a couple of minutes on cookie sheet before transferring to rack to cool completely. Prepare your icing of choice (see recipes below). Frost cookies. It's OK if some of it drips over the edge, as it will add to the "melted" effect. Spray a microwave-safe plate with cooking spray, place marshmallows on it and microwave for 15-20 seconds. Watch them carefully and remove before they start to puff up too much. Once marshmallows and icing has set up, decorate as desired! Using an electric stand mixer or hand mixer, beat all ingredients together until creamy. Add more milk if necessary to get the desired consistency. In the bowl of your electric mixer (or with a hand mixer), beat the confectioners' sugar and meringue powder until combined. 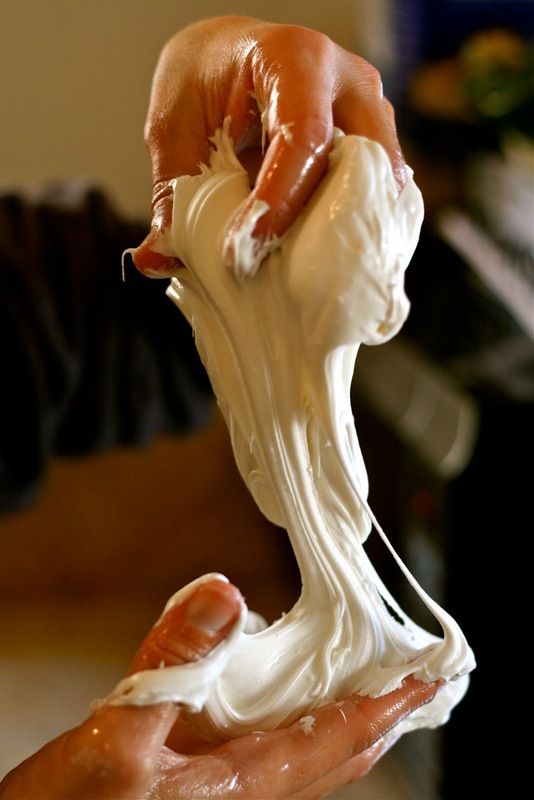 Add the water and beat on medium to high speed until very glossy and stiff peaks form (5 to7 minutes). If necessary, to get the right consistency, add more powdered sugar or water. Form the fondant into a ball, wrap it tightly in plastic wrap, and refrigerate overnight. I love these cookies!!! You really gave great instructions and pictures too....will have to try these for sure...Thanks for the different options for the frostings too....Merry Christmas!! !